So I stopped at my local gun store today to look at ankle holsters, and I figured I would ask when they expected to get in an XDm 45. Surprise... they received 6 of them Friday... and sold 3 of them already (today is Monday). Here's a pic I took with my blackberry. It's blurry because my hand was shaking in the struggle to avoid impulsively reaching for my wallet. I may go back and pick one up in a couple of days (if they're still in stock, that is...). XDM's are great guns, especially for the value, they give even CZ a fight. Glocks being on the other fail end of the value spectrum. XDM's start out with slightly spongy and gritty triggers, but once you break them in, their stock triggers get REAL smooth. Just brought a friend to buy hers a couple weeks ago. She only had to pay $50 more for the stainless slide model than then black. The XDM is a great gun, I have on in 9mm. I want to get a FNX-9 to compare the two. This is a map that when you click on a state gives the gun shops with XDM45s. 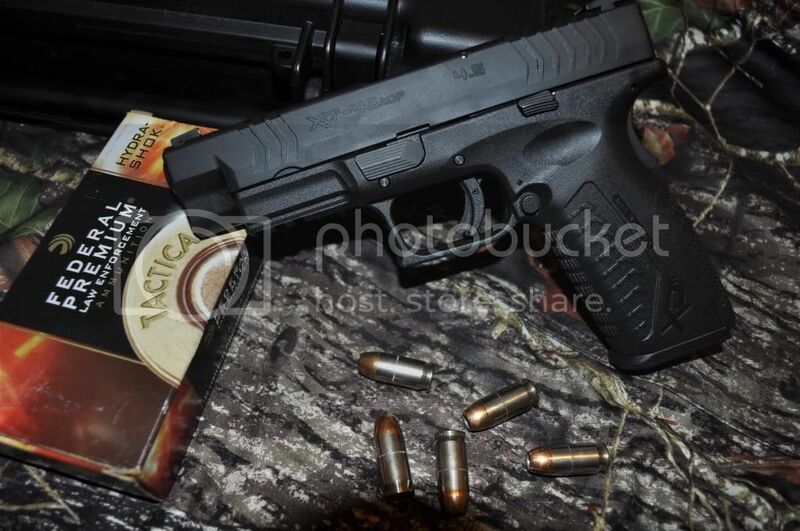 This is a brochure for the XDM45. jmz5 wrote: The XDM is a great gun, I have on in 9mm. I want to get a FNX-9 to compare the two. If you do, please give us a full report. I'm not sure whether to get a XDM .45 or a FNP .45 Tactical. Big price difference but quality of the weapon is key, right? If anyone gets their hands on both of these together, a side by side comparison would be awesome! Value goes to XDM hands down. 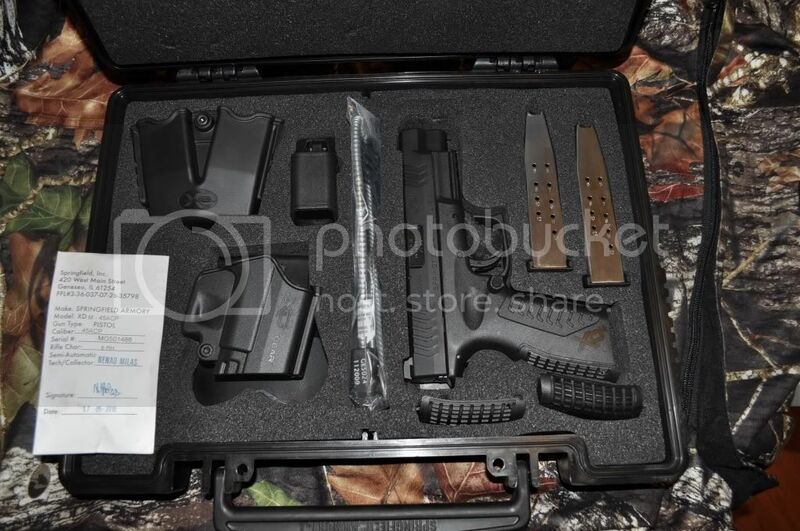 You get mag pouch, 2 great cap mags, holster. I don't see triggers as being an issue, as the XDM is great and the FNP-T probably uses the same mech as the FNX/FNP's. They are very decent/good triggers, even for match shooting. Accuracy also isn't an issue, both have match bbl's. It comes down to whether you're FORSURE going to mount a red dot. If you are, don't bother getting an XDM and a melt treatment to attain a good plane for your sight picture. Those melt jobs cost upwards of 300/400, might as well buy a new gun. The FNP-T's are already treated and to factory specs, even better. They cowitness pretty much, so another plus. Another big issue is ergonomics; you'll have to handle the XDM and the FNP's yourself to determine this. However, if you're unsure, I'd go with the XDM for value. 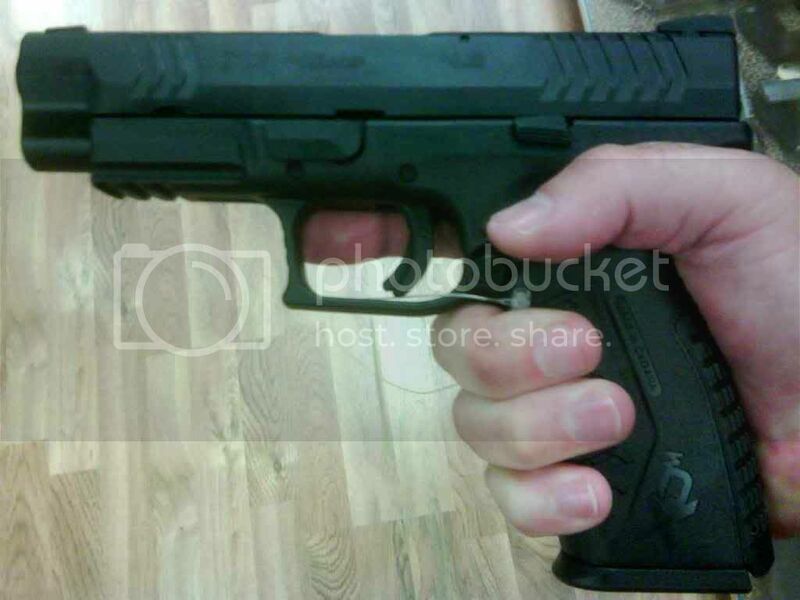 New Baby Pics: It's an XD(m) 45!!! Ok, so I decided I needed a fathers day gift and headed back to the gun store - just got home with this new arrival. Note the date on the test round envelope, this baby is only 1 month and 2 days old! Nice set, congrats on the acquistion! MrSlippyFist wrote: Springfield makes pistols? I shot the first 100 rounds of Remington 230gr JHP mostly at steel plates from 15-20 yards to get a feel for the gun. The trigger felt identical to my XDm 40 when I first shot that gun so in that respect it required very little getting used to. The recoil seemed to be about 70% of my 1911 which I thought was strange since the XDm weighs in at 31oz (empty) vs. 38oz for the 1911. Maybe it's the heavy-duty spring they put in this gun. My groupings were 4-6" at 15 yards which kind of bummed me out because I am much better with the XDm 40, so I decided to try it at 7 yards. 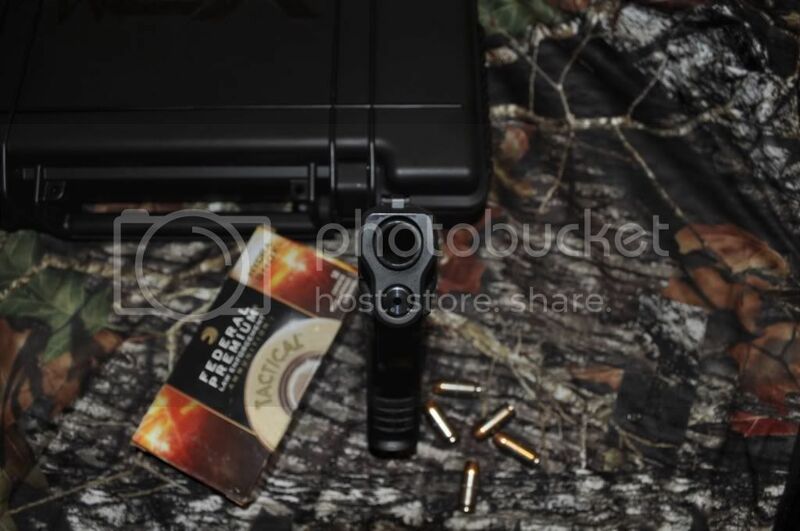 I also switched to Federal Hydra-Shok 230gr. Groupings immediately went to 2" or better and after 50 rounds I was still low and to the left but very tight. Zero failures of any kind in the 150 rounds I shot, relatively low recoil and the gun is as easy to break down and clean as the FsN... I can't wait to get some more trigger time on the XDm, I think I'm gonna like this gun! Some people are like, "dude, this is supposed to be a MATCH gun, why is the trigger so sh*tty?!!" Hope you have broken it in or will do it soon!! There's a huge difference. I shot an XD-9, and by no means am I a decent shot with any gun for that matter, even my own gun, but out of 20 rounds I fired, I got all but 3 in the center bullseye (about 4inx3in) from 7 yards. I couldnt muster that even with laser sights on my own firearm. What is the magazine capacity? I really liked this doublestacked .45 Para-Ordinance firearm I checked out at my Local gun store. Held 13 rounds. Superjew wrote: I shot an XD-9, and by no means am I a decent shot with any gun for that matter, even my own gun, but out of 20 rounds I fired, I got all but 3 in the center bullseye (about 4inx3in) from 7 yards. I couldnt muster that even with laser sights on my own firearm. They weigh 31oz, are a snap to break down & clean, are pretty darn accurate right out of the box and as Blue said, the triggers get very smooth with use. They also come with interchangeable backstraps to fit different size hands. All in all, I believe them to be an excellent value, extremely reliable and a great gun to shoot! I'm a little late on this thread but if u haven't tried or held a xdm45 beware, u might come home with one! I love it! Everything I hated about the original xdm40 has been fixed, and after talking to my shop guys they informed me that they built the gun around the mag to help keep it slim, and its sliim for a double stack45. My fiance with her little hands has no issues using it, she even thinks its on par with my cz75d compact. 1) I forgot how darn good the gun feels in my hand. 2) 230gr HSTs have a tad more recoil than your typical 5.7x28 round. D) Shooting accurately with a particular gun is definitely a perishable skill!